Harold and Marian Andersen Crane Meadow is a 12-acre recreation of the Platte River where Sandhill cranes and trumpeter swans grace the waters. It features a marsh-like area and large sandbar, similar to those found in the sandhill areas of western Nebraska. This area is also inhabited by other native wildlife, such as ducks, geese and shore birds. Sandhill cranes are a large and primarily grey bird with a red-skin forehead and white cheeks. They average from eight to 10 pounds, stand three to five feet tall and have a wingspan ranging from five to seven feet. They are a migratory bird and have a native range spanning from northeastern Siberia to Cuba. 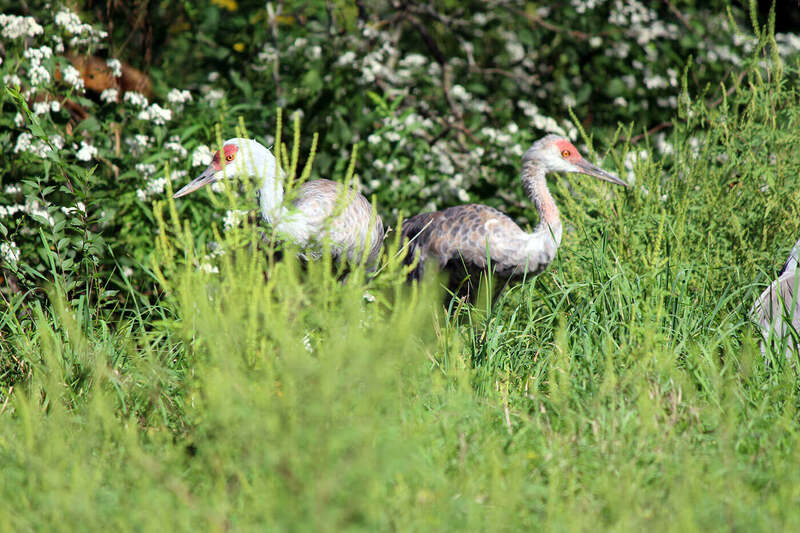 There are five subspecies of crane: the lesser, Florida, Mississippi, Canadian and Greater Sandhill cranes. The Sandhill crane is listed as least concern on the International Union for Conservation of Nature's Red List of Threatened Species. Fun Fact: A large number of Sandhill cranes migrate through the Sandhills of western Nebraska. Trumpeter Swans are the largest waterfowl found in North America, averaging 25 to 35 pounds with a wingspan of up to eight feet. They are covered in white plumage and sport a black bill, face and legs. They can be found in Alaska down through central North America in freshwater marshes, ponds and lakes. The several zoos that house trumpeter swans, mostly in the Midwest region, participate in reintroduction programs in partnership with the U.S. Fish and Wildlife Service. These programs involve breeding the birds in human care and then preparing them for release into the wild. Thanks to programs like these, this species is now list as least concern on the International Union for Conservation of Nature's Red List of Threatened Species. Fun Fact: The Trumpeter Swan was heavily hunted in the 19thand 20th centuries as their large flight feathers were sought after for making quill pens.